LinkedIn is the top online site for professional, social and career networking. The site functions as an online directory of individual professionals and organizations, and facilitates the process of professional networking without having to leave your office. As of late 2018, LinkedIn had more than half a billion members in more than 200 countries, including executives from all of the Fortune 500 companies. While individuals use LinkedIn for professional networking, connecting, and job searching, companies use it for recruiting and for sharing company information with prospective employees. It's a terrific site for job searching, as well. You can learn to use LinkedIn effectively and understand the best way to use LinkedIn's resources for job hunting and building your career. Below you will find some quick tips on how to use LinkedIn effectively, along with links to more in-depth articles on each topic to help you make the most of all the resources and tools LinkedIn has to offer. You'll find it quick and easy to get started using LinkedIn. Start by signing up for an account and create your online profile. The site offers two main tiers of membership: Basic and Premium. The Premium tier has four subcategories: Premium Career, Sales Navigator, Recruiter Lite, Premium Business, LinkedIn Learning, each with its own cost. The Basic account offers features such as messaging, profile creation, and ways to apply to job postings, while the Premium accounts have added features and resources to expand your online presence and let you get more out of the service. As soon as you log in, you can start using LinkedIn to connect, network, and search for jobs. LinkedIn offers useful resources for job seekers, providing information, acting as a billboard to highlight your unique value proposition, and making your information public for recruiters who may be looking for what you have to offer. Ready to get started? It's simple. Navigate to LinkedIn.com, enter your first and last name and email address in the indicated area, and create a password. You'll want to make a good first impression on anyone who views your profile, and a big part of that is the picture you choose. You should opt for a professional-looking photo rather than a casual shot. You don't necessarily have to shell out big bucks for a head shot, but care should be taken when choosing the right clothes, background, lighting, etc., for your LinkedIn profile picture. Your LinkedIn profile summary is a chance to put your best foot forward, especially if you are interested in new job opportunities. LinkedIn has a 2,000-character limit for this section, and you want to make the most of it. The company recommends writing three to five short paragraphs and leaving plenty of white space so readers' eyes don't glaze over when they land on your page. The company also suggests using short, tight sentences, avoiding jargon, writing in the first person, and using keywords. Don't be afraid to inject some of your personality into your profile summary to make it memorable, but steer clear of anything that seems too unprofessional or could be controversial. Finally, make sure you proofread this section carefully, as you would a cover letter for a job application. Typos and sloppy writing will send the wrong signal. In addition to a summary, your LinkedIn profile can contain your work experience, education, skills, and endorsements and recommendations from others in your network. Your profile helps you get found on LinkedIn because it contains searchable keywords in the information you post about yourself. Your profile benefits from including relevant keywords that search engines and hiring managers look for. Including these buzzwords in your summary, interests, former job titles, and skills can help you stand out. Recommendations are another great way to make your LinkedIn profile stand out. Positive recommendations written by previous employers, clients or colleagues can show a hiring manager what kind of employee you are and what your strengths are. You have the ability to request recommendations from your LinkedIn connections. Endorsements are a quick and easy way for your professional contacts to help show other users where your expertise lies. Including your LinkedIn URL on your resume makes it easy for prospective employers to visit LinkedIn to learn more about you and your skills and qualifications. LinkedIn will assign you a URL unless you create a custom one. To create a custom URL, click the "Me" icon at the top of your LinkedIn homepage and select "View profile" from the drop-down menu. On the right-hand side of the page, click "Edit public profile & URL." Try using your first and last name. If that is taken, try a middle initial or your full middle name. Just make sure that your profile is up to date before including a link to it on your resume. Once you sign up for LinkedIn and create a profile, you can start to build a network of contacts, including people with whom you connect on a professional basis, an educational basis, or based on another common interest. Send contact invitations to people who meet one or more of these objectives. When you message people within or outside of your network, keep it professional. You'll increase your response rate if you keep your messages on point. How Big Should Your Network Be? 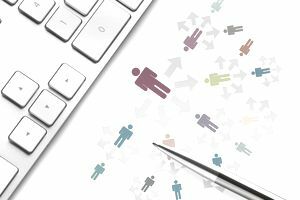 How many people do you need in your LinkedIn network to make it an effective tool for job searching and career networking? The short answer is, it depends. The right connections are more important than the actual number of connections you have. Ideally, you want connections that are relevant to your line of work, that can potentially lead you to a job opportunity, or can provide valuable advice. Job seekers can search and apply for jobs directly on LinkedIn. In addition, you can view and contact your LinkedIn connections who may be able to refer you for a job. Targeted searches such as the advanced people or company finders can sharpen your scope and help you find exactly what you are looking for. You can filter the advanced search by location, industry, alumni status, or number of employees to get more concise, specific search results. LinkedIn company profiles are a good way to find more information on companies in which you have an interest. You'll be able to see if you have any connections at the company, new hires, promotions, jobs posted, related companies, and company statistics. After reading this article and the related links, hopefully you have a solid grasp on how to use LinkedIn effectively. Below are a few more tips for using the site. The more complete your LinkedIn profile is, the better your chances to be found and contacted. Use your LinkedIn profile like a resume and provide prospective employers with detailed information on your skills and experience. And be sure to customize your profile’s unique URL to make it easier to find and increase its visibility. Updating your LinkedIn profile to reflect that you're unemployed can create an issue. Even though you might be unemployed, you must still present yourself in a positive light to prospective employers and to networking contacts. The LinkedIn Mobile App features include searching and viewing profiles, inviting new connections, accessing LinkedIn answers, and actionable network updates. You can send and receive messages, look up user or company profiles, and even upload your resume to job openings all in the palm of your hand. Use the app to keep your job search moving forward when you're on the road. LinkedIn has the same challenges as other sites, so watch out for scammers.